Status : Declared enemy of Chronos. Description: Subject is one of several that have bonded with one of the 16 experimental units that the Creators brought to Earth. Like many of the others, this Zimbabwean Mercenary originally allied himself with the US ACTF but has since gone renegade and allied himself, along with several of his fellow merc Guyvers, with the Baxter Corporation. Present estimates of Guyver type abilities have been compiled and summarized below. -Physical strength: Subject possesses the standard Guyver strength of approximately 100 men. -Unit possesses a pair of roving orbs on either side of subjects head that along with protruding antenna makes up a hyper sensory system that can detect the motion of multiple targets, even through obstacles such as wall and other barriers and has a range of approximately 100 meters (~328 Feet). -Durability: Subjects bio-armor is derived from a combination of organic and inorganic components that gives it a dexterity of about twenty times that of steel and has the ability to regenerate both armor and host completely from any amount of damage that does not impair the functionality of armors Control Medal, consequently the only way to kill a Guyver is by use of a unit remover or the destruction of the Control Medal. -Speed: Subjects has a reflex speed that ranges from 5 to 40 times normal, a top ground speed of up to 250 MPH, and a top air speed of 300 MPH. -Subject also possesses a highly efficient infrared laser orb emitter located just above the Control Medal, though the weakest of the Guyvers weapons, the laser is capable of killing standard Zoanoids and can be fired with both extreme speed and accuracy at any target within subjects field of vision. Laser has also been shown to be able to be fired in a continuous beam that can easily slice through most material such as steel I-Beams. -Subject has two standard retractable vibrational swords, one on each arm, composed of specialized bio-armor material and are capable of slicing easily through almost anything they come into contact with the exception of other similarly or above rated vibrational weapons or material specifically resistant to vibrational weapons attack. -Mega Smasher: Extremely power particle beam cannon weapons, capable of destroying everything in their path. The subject has two mega-smashers, one within each of its open able chest plates, and can be used individually for maximum control or together for maximum destruction. It takes time to open the protective covers over the mega-smasher cannons, as well as several seconds to fully empower the beam which leaves subject vulnerable to attack. Though power output varies from time to time, this extremely power weapon can easily destroy a skyscraper in a single blast. -Sonic Emitters: Located around mouth of subject, they produce a sonic blast that can vary intensity from just producing ear-splitting noise to actually being able to destroy objects, such as making a human head explode or destroy incoming mini missiles. Emitters have a set radius of 45 degrees and a range of 15 to 20 meters. -Gravitational powers: Subject possesses a gravity control orb located in the middle of its waist that can generate and focus gravitational energies for a variety of uses, ranging from simple flight to the generation of a Pressure Cannon. The Pressure Cannon is a gravity weapon and is basically a ball of concentrated kinetic energy that produces the equivalent impact force of an armor piercing tank shell and has a range of over 30 meters. 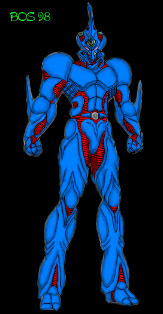 As a standard Guyver, subject can fire up to three Pressure Cannons in rapid succession as well as use the generating matrix of the Pressure Cannon to produce a direction shield that can block anything short of a Mega Smasher, the Pressure Cannon can also be fired single headedly at reduced power. The only real limitation of the Guyvers gravitational abilities is that it only has one gravity control device so gravitation power can only be used for one thing at a time at full power, combinations like flight and pressure cannon will both work at only half their normal power level if used at same time. -Unit has also shown the ability to compensate for environments that would otherwise be hostile to its host. Though armor doesn’t possess an oxygen supply, armor keeps the host in an oxygen rich pressurized environment and acts as a rebreather for host so even in total vacuum that unit can extend host internal air supply so host can survive up to twenty minutes on one breath of air. Additionally unit can filter out oxygen from surrounding environment so host can survive in otherwise hostile environments such as areas filled with poisonous gases or underwater. -The unit possesses standard limitations of host combat skills and stamina as a human host cannot maintain the Guyvers power levels for prolonged periods of time, though unit has shown the ability to regenerate host energy reserves as needed provided the host refrains from using high energy draining weapons such as units Mega-Smashers repeatedly, this reduces strain on host to simple mental stress of using armor.